Strabane (/strəˈbæn/ strə-BAN; from Irish: An Srath Bán, meaning "the white strath"), historically spelt Straban, is a town in west Tyrone, Northern Ireland. It was the headquarters of the former Strabane District Council. Strabane has a population of around 18,000. It is the second-largest town in Tyrone, after Omagh. It lies on the east bank of the River Foyle and is roughly equidistant from Omagh, Derry City and Letterkenny. The River Foyle marks the border between Northern Ireland and the Republic of Ireland. On the other side of the river (across Lifford Bridge) is the smaller town of Lifford, which is the county town of County Donegal. The River Mourne flows through the centre of the town, and meets the Finn to form the Foyle River. A large hill named Knockavoe , which marks the beginning of the Sperrin Mountains , forms the backdrop to the town. The locale was home to a group of northern Celts known as the Orighella as far back as the fourth century when the territories of Owen (later Tír Eoghain) and Connail (later Tír Chonaill - mostly modern County Donegal) were established, and Orighella were assimilated into the Cenél Conaill. With the arrival of Saint Patrick, a mission established a church in the area near Castlefin, and having visited the Grianán Aileach for the conversion of Owen, returned along the Foyle river, establishing a further church at Leckpatrick (the name means 'the flagstone of St. Patrick'). A later church was established at Lifford/Clonleigh by a mission headed by St. Colmcille. In AD 586 St. Colgan established a monastery at Camus [from whence the parish of Camus-Juxta-Mourne gets its name]. Other monasteries and religious sites were established at this time at Urney, Ballycolman, Donagheady, and Artigarvan. Vikings arrived at Lifford in AD 832 and maintained a presence on the Foyle until AD 863 when they were expelled by Áed Findliath. The regional seat of power was to be the Grianán Aileach until 1101, when it as destroyed by the O'Briens of Thomond, and was then moved to Urney, three miles outside Strabane. In 1243, the seat of power for all Tyrone and the O'Neill dynasty was moved to Cookstown. It was during this epoch, in AD 1231, that Franciscan friars established a religious foundation on what is now the old graveyard at St. Patrick's Street, Strabane. The town was settled by Scottish families in the 1600s, an action that preceded the Plantation of Ulster. In 1608, during O'Doherty's Rebellion, most of the inhabitants fled to the safety of Lifford following Sir Cahir O'Doherty's Burning of Derry, as it was feared that Strabane would be his next target. In the late 20th century, during the height of The Troubles, Strabane garnered the dubious distinction of the highest unemployment rate in the industrial world. It is one of the most economically deprived towns in the United Kingdom. Huge economic damage occurred when much of the town centre flooded in 1987. In August 2005, a Channel 4 television programme presented by property experts Kirstie Allsopp and Phil Spencer named Strabane the eighth-worst place to live in the UK, largely owing to unemployment. Strabane had been moved out of the top 20 in the 2007 edition. As a result, the Strabane Community Unemployed Group, was founded to find solutions to long-term unemployment and combat the causes for unemployment. Sister Mary Carmel Fanning, a retired Catholic girls school principal who had been awarded the MBE for her services to education in 1997, became a director of the Group the following year. Strabane suffered extensive damage during the Troubles, from the early 1970s and continuing throughout much of the 1990s, with bombings and shootings commonplace; Irish Republican paramilitary groups, mainly the Provisional Irish Republican Army, regularly attacked the town's British Army and Royal Ulster Constabulary (RUC) bases. Strabane was once the most bombed town in Europe in proportion to its size, and was the most bombed town in Northern Ireland. Many civilians and members of the security forces were killed or injured in the area over the course of the Troubles. Many British Army regiments from England, Scotland and Wales served in Strabane at various times during the Troubles in the barracks at the locally named "Camel's hump" beside Lifford Bridge. 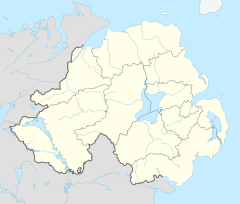 As a result of the Good Friday Agreement, there is no longer any British Army presence in the town. Strabane became involved in the Ulster Project International, sending Catholic and Protestant teenagers to the United States for prejudice-reduction work. Little trace remains of Strabane's railways except for one old railway building that survives in the town. The nearest railway is operated by Northern Ireland Railways and runs from Londonderry railway station via Coleraine to Belfast Central railway station and Belfast Great Victoria Street railway station. The strategically important Belfast-Derry railway line is to be upgraded to facilitate more frequent trains and improvements to the permanent way such as track and signalling to enable faster services. 17.43% had some knowledge of Irish (Gaelic) and 3.49% had some knowledge of Ulster-Scots. The local Gaelic football team, Strabane Sigersons, and the hurling team, Strabane Seamrogaí, are expanding. Owen Roe O'Neill's GAC, Leckpatrick, can also claim part of Strabane with the North part of the town following under their parish umbrella. The Sigerson Cup, the all-Ireland colleges cup for Gaelic football, is named after a native of the town, Dr George Sigerson. Strabane Cricket Club and Fox Lodge Cricket Club are members of the North West Senior League. Strabane also boasts several local football teams that play in various leagues. The most senior is Strabane Athletic F.C. of the Northern Ireland Intermediate League. The town has three golf courses. Strabane Golf Course is an 18-hole parkland course set in the foothills of the Sperrin Mountains, 1 mile south of the town. Strabane also has a large number of road runners. The local 10k race which is run in July is well supported by local athletes as well as those from farther afield. Strabane also hosts the Tyrone Titans, a new franchise in the historic IAFL. The River Mourne, River Finn , Burn Dennet River, Moor Lough and Lough Ash are all within easy access of the town therefore providing many opportunities for fishing. A common greeting in Strabane and the wider North West is "What's the bars?" This means "What's the news?" or "What's the latest gossip?" This may derive from Irish, from the phrase "barr nuachta," meaning "titbit," referring to a tasty piece of news. Sacred Heart Roman Catholic church. According to the 2011 census, 93.3% of the residents were from a Catholic background and 7.22% were from a Protestant background  There are a number of places of worship for the residents of Strabane and surrounding district. The three main Catholic churches are the Church of the Immaculate Conception, Barrack Street, Sacred Heart Church, Derry Road and St. Mary’s Church, Melmount Road. The main Church of Ireland church is Christ Church, Bowling Green. The main Presbyterian Church is located on the Derry Road while the main Methodist Church is located on Railway Street. . There are also a number of smaller churches. Education in Strabane is provided by a mixture of infant, primary and secondary schools. The central location of the town allows parents the choice of schools in Derry, Omagh and Donegal. There are two secondary schools in the town: Holy Cross College and Strabane Academy. Holy Cross College was created in 2003 with the amalgamation of Strabane's three Catholic post-primary schools, the Convent Grammar School, St Colman's High School and Our Lady of Mercy High School. The College had been operating across the three sites until its 29m state-of-the-art new building opened in September 2009, catering for 1,400 pupils. Holy Cross is a co-ed bilateral college, which means it offers grammar status education within an all-ability school. It is regarded as a blueprint for the future of education in Northern Ireland because it caters for both academic and vocational paths. The other secondary school is Strabane Academy which was formed in 2009 when Strabane Grammar School merged with Strabane High School. The National Trust owns a Strabane shop in which John Dunlap learnt the printing trade. Dunlap went on to print the United States Declaration of Independence. Strabane transmitting station is a broadcasting and telecommunications facility owned and operated by Arqiva. It includes a 305.5 metre (1,002 ft) high guyed steel lattice mast, which is the tallest structure in Ireland. The transmission antennassurmounting the structure are contained within a fibreglass cylinder. Constructed in 1963, it came into service on 18 February of that year. Andrew Frederick Gault (1833–1903), merchant, industrialist, and philanthropist known as the Cotton King of Canada. Wikimedia Commons has media related to Strabane. ^ "Snapshot: The magazine of Strabane District Council" (PDF). Retrieved 30 June 2015. ^ "The Fair River Valley : Strabane through the ages". Retrieved 19 November 2018. ^ "Flood disaster recalled - 25 years on". Derry Journal. 16 October 2012. Retrieved 8 July 2017. ^ "The Best and Worst Places to Live in Britain". Channel4.com. Retrieved 30 June 2015. ^ "Town shrugs off dismal TV label". BBC News. Retrieved 24 May 2010. ^ "NICVA". Retrieved 19 November 2018. ^ "Listing". www.thegazette.co.uk. 13 June 1997. ^ "How one gay bar changed attitudes in rural N Ireland". Channel 4 News. Retrieved 8 November 2018. ^ "Ulster Project International". Ulsterproject.org. Retrieved 30 June 2015. ^ a b c d Hajducki, S. Maxwell (1974). A Railway Atlas of Ireland. Newton Abbott: David & Charles. map 3. ISBN 0-7153-5167-2. ^ Patterson, Edward M. (1962). The County Donegal Railways. Dawlish: David & Charles. pp. 10–11. ^ Baker, Michael H.C. (1972). Irish Railways since 1916. London, UK: Ian Allan. pp. 153, 207. ISBN 0-7110-0282-7. ^ "Statistical Classification and Delineation of Settlements" (PDF). NI Statistics and Research Agency (NISRA). February 2005. Table 3 / Band C - Large Town. Retrieved 26 September 2018. ^ a b "Census 2011 Population Statistics for Coleraine Settlement". Northern Ireland Statistics and Research Agency (NISRA). 2011. Retrieved 5 June 2018. ^ "Strabane". www.discoveringireland.com. Retrieved 24 July 2018. ^ Strabane Golf Course website, strabanegolfclub.co.uk; accessed 7 July 2015. ^ "Naíscoil an tSratha Báin". Retrieved 30 June 2015. ^ "History of Gaelscoil Uí Dhochartaigh". Archived from the original on 12 March 2012. Retrieved 30 June 2015. ^ Quinn, Andrew (17 May 2017). "30 words and phrases only Derry 'wans' will know". Retrieved 5 November 2018. ^ "English-Irish Dictionary". 1959. Retrieved 5 November 2018. ^ "Maurice Harron-Artist-sculptor". Mauriceharron.com. Retrieved 2 May 2012. ^ "The Tinneys". Very Derry. Retrieved 2 May 2012. ^ "Strabane (Camus) Parish". Retrieved 19 November 2018. ^ "Christ Church, Strabane". Retrieved 19 November 2018. ^ "Methodist Church - Strabane". Retrieved 19 November 2018. ^ "Holy Cross College hailed as a beacon". Retrieved 9 June 2018. ^ "Strabane Academy". Retrieved 19 November 2018. ^ "NWRC". Retrieved 19 November 2018. ^ "World Travel Destinations, Culture and History Guide". Geographia. 3 October 2006. Retrieved 2 May 2012. ^ "BBC News". BBC News. 8 May 2008. Retrieved 30 June 2015. ^ "Famous People – Strabane History Society Website". strabanehistorysociety.org. Retrieved 24 July 2018. ^ "Jail breaker on police killing charge". BBC News. Retrieved 30 June 2015.